Poor little French moppet is dumped in orphanage; years later, skinny waifette seeks fame and fortune as a singer and by sheer force of will, good luck, and well-placed lovers, succeeds beyond her wildest dreams. But this is not La Vie En Rose – it’s Coco Before Chanel, clearly aiming for the same place in the hearts and minds of film goers. 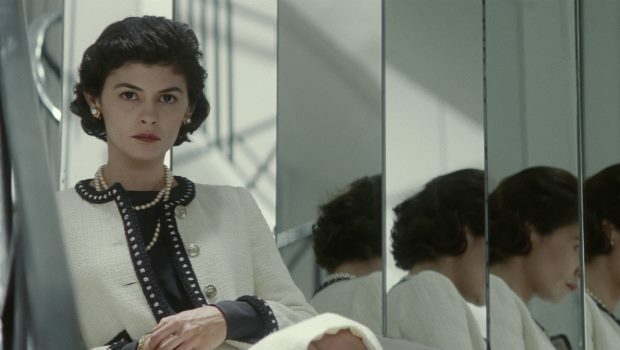 Big-eared ingenue Audrey Tautou plays Gabrielle Chanel as an awkward but fiercely ambitious teenager, who with her sister Adrienne, attempts to make it big as a music hall act, sewing during the day to pay the bills. Their most popular duet, about a lost puppy called Coco, gives Gabrielle her nickname…. but Adrienne’s heart belongs to her wealthy aristocratic lover, and she leaves her sister to move in with him. Once its clear that she has no future as a singer, Coco decides to make her own luck, and basically moves into the house of an old lover, the wealthy, cynical and easy-going Etienne Balsan (Powelvoorde), who is willing to have Coco live with him as his mistress as long as she makes no demands on him. The two settle into an odd kind of domesticity; at first, when Etienne has guests, Chanel stays out of the way and eats in the kitchen. But gradually she becomes more and more part of his life, learning to ride and making friends with the actresses and whores who frequent his parties. As a hobby, she begins to make hats for some of them. And then one day she meets Arthur Capel (Nivola), known as Boy, dashing, English, romantic (despite a horrid little Hitler ‘tache). Tough as old boots Coco, always so dismissive of love, falls for him like a ton of bricks and, with Etienne’s blessing, the two of them holiday in Deauville, where Chanel makes a huge impact at the Casino in a simple black lace and silk gown of her own design, pearls, and no hat, feathers, or corset. Students of fashion history will doubtless know that quite a few liberties have been taken here and of course by settling the story ‘before Chanel’ director Anne Fontaine avoids the problematic Nazi years. Knowing very little about Chanel, this didn’t bother me. What did bother me is that her story, unlike that of Edith Piaf, just didn’t feel that interesting. Coco always seems so sure of herself, so truculent and ungracious. She is supposed to be this great iconoclast, ripping away at the fussy. constricting clothes that held Edwardian women prisoner, but for most of the film dresses like a servant, a drab little sparrow contrasted with the gorgeous peacocks of the Edwardian era. Where is her inspiration? What drives her? There’s very little insight – its not like she has to work, or as if she’s been partticularly independent up to this point; in fact she’s been more than happy to stomp around Balsan’s chateau wearing his pyjamas like a sulky teenager. I feel a bit depressed that, once again, a woman can’t be happy and successful at love and at work. One or the other, little Gabrielle! The company that still bears Chanel’s name is now of course run by a man. Chanel is the complete opposite of a heroine and that should be interesting in itself, but because she is so tough and invulnerable, we never get under her skin – she remains a caricature, never really coming alive. A bit like one of the models she dresses (a particularly jarring anachromism:the super skinny models used in the final scene).